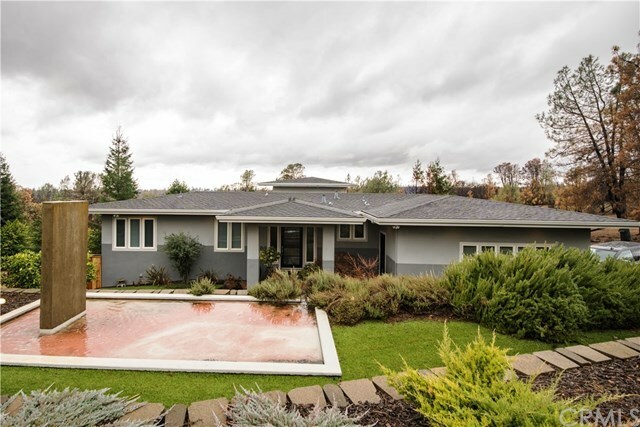 This beautiful custom-built home located within a gated community and just minutes from Lake Oroville was designed by the award-winning San Francisco architect David Kesler. A very modern design indeed with quality construction throughout the entire home. Featuring; Brazilian pecan wood floors, high ceilings, comfortable open floor plan. A stunning Chef style gourmet kitchen with top grade appliances such as the DCS 6 burner gas range with a built-in grill and pot filler. This chef style kitchen includes a double Jenn Air convection ovens, Bosh dishwasher, Frigidaire refrigerator and freezer, quarts counter tops, a wine cooler, 7â island with a prep sink. The kitchen even Includes a butler pantry with a second Bosh dishwasher, with its own sink and lots of storage as well. There is also plenty of windows that allows a substantial amount of natural lighting that flows tastefully from the kitchen to the open comfortable living room and warm fireplace. The master suite includes a huge walk in closet, dual sinks, walk in shower with dual shower heads and a Duravit oversized soaking tub. There are also two additional bedrooms with their own walk in closets as well and a den/office that could easily be used as a fourth bedroom. This quality home even includes its own private theater room along with a spacious 3 car garage, and a 7â water fall. Directions: Approx.2.5 miles north of Lime Saddle Marina on Pentz Rd to Casa Del Ray.